The bad-tempered gaming machines are back for another six-part series with the renewal of E4’s Bad Robots prank show. In the show, unsuspecting members of the public encounter all kinds of malevolent machines, from pub quiz machines to car park ticket vendors that run away when you reach for the ticket. The show is made by Objective Productions – who previously used Manco gaming machines as props in their series Fresh Meat. 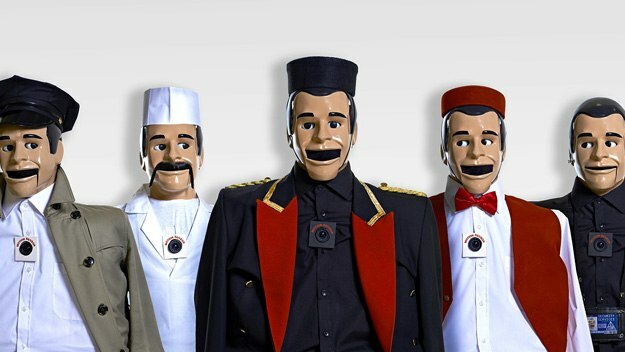 In Bad Robots, the fictional company logo on the unruly machines is TezCorp Industries, and their ‘computerised’ voices are actually provided by performers including Rob Delaney and stage legend Sir Michael Gambon. As you might imagine, some of the language used by the victims of the show is fruitier than your local pub’s slot machine. But thankfully the family-friendly version of the show, dubbed ‘Bad-ish Robots’ and scheduled for a pre-watershed slot, is also making a return, so parents with young children can enjoy a slightly cleaned-up version of the series too. Juke box hire is a simple way to add some music to your establishment – and if you’ve ever felt like having a song playing seems to have a disproportionate effect on how much you enjoy being in a venue, you could be right. According to researchers at UC Berkeley, there is a link between the sense of awe we associate with art, music and natural beauty, and the level of proteins known as cytokines in the body. When we experience emotions like awe, wonder and amazement, we typically have lower levels of cytokines in our body too, and these have been linked with everything from inflammation to depression and heart disease. That may well mean the sense of relaxation you feel when your favourite song comes on is a genuine life-preserving effect – putting a whole new significance on juke box hire to allow your patrons to play the music they love whenever they like. If you’re interested in slot machine hire, you might be keen to learn more about the type of person who is likely to play on your machine. Recently published research in the academic journal International Gambling Studies sheds some light on this, based on a study of Norwegian adolescents. The research was particularly interested in the factors that encourage people to start gambling in the first place, hence the decision to target relatively young participants. Over 2,000 people of both genders responded to a postal questionnaire, and while their age meant most were in full-time schooling, a fifth also had part-time jobs. The researchers found broad agreement that people should be free to decide for themselves whether they want to gamble or not, and that doing so is “not a fool’s game”. Individuals with family and friends who approve of gambling are more likely to approve of it themselves – a case of ‘peer approval’ more than of ‘peer pressure’, and described as “the strongest correlation by far”. The study also found men more likely to feel favourable towards gambling, along with those with more knowledge about it, and ‘sensation seekers’ such as those who would seek out an exotic holiday. So once you arrange your own slot machine hire, you are likely to see your machine played on mostly by thrill-seeking men with past experience of gambling – which is perhaps the outcome many people might have predicted.